SISSONVILLE, W.Va. — Sue Bonham was ready to die. 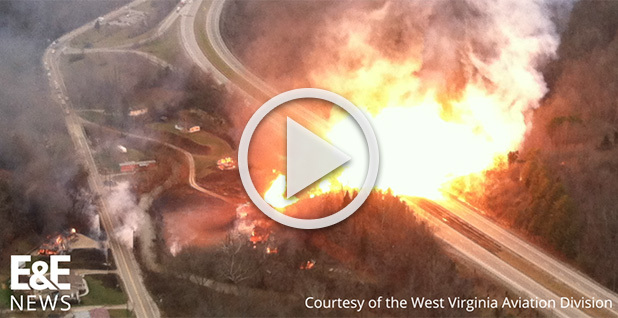 A ruptured high-pressure natural gas pipeline was firing a flame at her house like a blowtorch. She was crouching by a fence in a flower garden behind her home about 200 yards away, struggling to breathe the scalding air. Her thoughts turned to the things she'd miss — grandchildren, birthdays, weddings — but she had made her peace. "God, please," she thought, "just don't let me know I'm going to burn alive." About 20 miles down Interstate 77 in Charleston, Jim Cooper was looking at his screen in the control room of Columbia Gas Transmission, trying to decipher an array of signals. It took about 10 minutes and two calls from a different gas company to determine a line had ruptured. It took nearly an hour to shut off the flow of gas. Across the road from Bonham that day in December 2012, the house of a night nurse was incinerated. Normally, the nurse would have been sleeping there. But she had left minutes before the blast to see a children's Christmas pageant. Up the hill, four hunting dogs died, trapped in their kennel. Bonham was lucky. Four local volunteer firefighters appeared in the haze and whisked her to safety. She still calls the men her "angels in the garden." 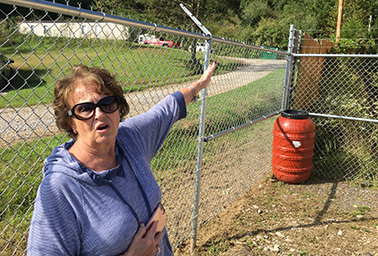 The transmission pipeline, which is called Line SM-80 and ran by Bonham's home and under nearby I-77, hadn't been inspected for 24 years, even after inspections of two parallel lines by Columbia Gas had found signs of corrosion. "I would have thought there should have been some big-time fines levied," said Bonham's husband, Paul Bonham. But there weren't. Federal regulators at the Pipeline and Hazardous Materials Safety Administration ordered Columbia to repair the line and inspect it at a higher standard. But they didn't seek a financial penalty. They rarely do. 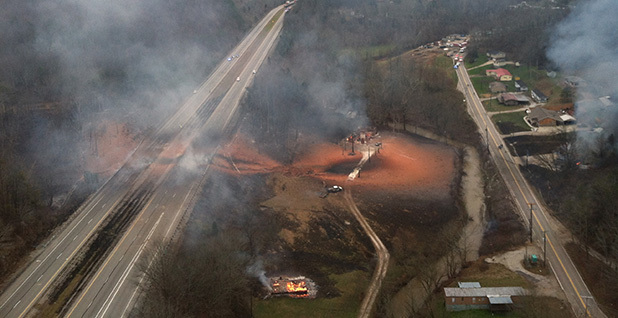 Since the beginning of 2010, interstate pipelines have exploded or caught fire 137 times, according to an E&E News analysis of interstate pipeline enforcement and incident data. In about 90 percent of those cases, PHMSA sought no fine. The fines totaled $5.4 million in the 13 explosion and fire cases where PHMSA did seek civil penalties in that eight-year period. That's less than one day of profits for TransCanada Corp., the company that owns the Keystone XL pipeline and that in 2016 bought the line that blew up near Sissonville. It's about $2 million less than TransCanada CEO Russ Girling's total compensation last year. TransCanada did not respond to repeated requests for comment. 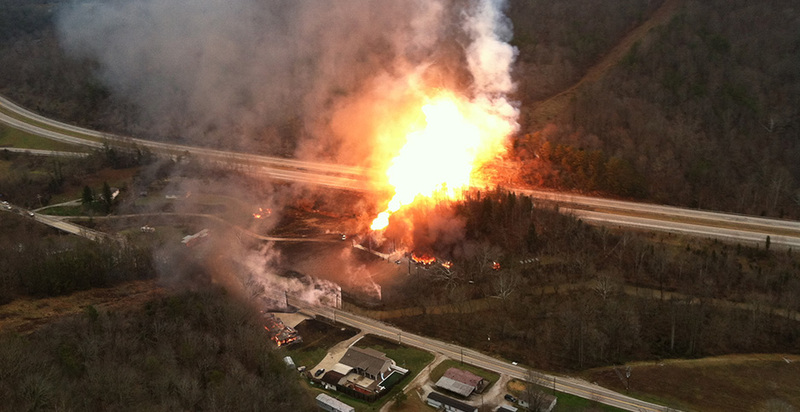 NiSource, which owned Columbia Gas Transmission at the time of the Sissonville explosion, declined comment. Some cases are still pending with PHMSA, such as a 2016 ammonia pipeline leak in Nebraska that killed a farmer and a 2016 gas line explosion in Pennsylvania the same year that left a man so badly burned that parts of his right arm and leg were amputated. PHMSA records show the agency has not taken steps to levy fines in those cases. In other high-profile cases, such as the 2010 gas explosion in San Bruno, Calif., that killed eight people, states had jurisdiction rather than PHMSA. California authorities prosecuted and won felony guilty verdicts against the company that owned the San Bruno pipeline. They also levied a $1.6 billion fine. The job of keeping interstate pipelines safe belongs to PHMSA, a relatively small unit of the Department of Transportation with a $250 million budget and 540 employees. About 200 of those employees are pipeline inspectors. The agency is led by a former railroad executive, Howard "Skip" Elliott. Elliott, an appointee of President Trump, has said he doesn't think increased penalties against pipeline companies would increase safety. "It is not as though we are going to inspire further carefulness with punitive measures," Elliott told the members of two oil and gas trade groups in a speech last month. He said the agencies need to "levy penalties where appropriate." But he said the companies represented in his audience, not regulators, were the ones who could reduce the relatively small number of pipeline accidents. But PHMSA itself stresses the importance of imposing penalties when it grades state pipeline agencies on their safety programs. One question on the agency's annual evaluation of state programs is "Can the state demonstrate it is using their enforcement fining authority for pipeline safety violations?" PHMSA directly regulates about 350,000 miles of pipeline, more than 400 natural gas storage sites and 26 liquefied natural gas facilities around the country. An additional 2 million miles of pipe in the United States is regulated by the states or is unregulated. The agency's job is growing as companies build new lines to capitalize on the country's oil and gas drilling boom, driven by hydraulic fracturing. More than 2,500 miles of new interstate pipe is under construction or has been approved. The 600-mile Atlantic Coast pipeline is to funnel gas from the Marcellus Shale to North Carolina. Keystone XL, if built, will transport oil from Canada into the U.S. pipeline system. Pipeline disasters are rare, relative to the vast amount of oil and gas they transport every day. But PHMSA's apparent reluctance to impose financial penalties isn't reassuring to people who live in the path of the pipeline construction boom. Bill Limpert, whose house in Virginia is within what he calls the "blast zone" of the planned Atlantic Coast pipeline, says it reinforces his opinion that pipeline companies — not safety officials — are in charge. "It almost seems like the industry can make money by skimping on safety and the fines don't catch up with them," Limpert said. "It seems like it's part of the cost of doing business." Safety advocates say PHMSA could do a lot more to push companies toward safety. "They've never been a particularly aggressive enforcement agency," said Rebecca Craven, program director at the Pipeline Safety Trust, a small safety advocacy group in Bellingham, Wash. "I don't know why." Cynthia Quarterman, who led PHMSA during the Obama administration, says the public often expects a bigger fine after a spill or explosion rattles a community. "That is always a big challenge," said Quarterman, now a distinguished fellow at the Atlantic Council. "The public's expectation is high; the regulator's resources and authority are often limited. We regularly requested more authority, but never got enough." Industry leaders say pipeline companies are constantly striving to make their operations safer. "Safety is our industry's core value, and protecting the public and the environment is the top priority for pipeline operators and a central component to pipeline design, construction and maintenance," Robin Rorick, vice president of midstream and industry operations at the American Petroleum Institute, said in a statement to E&E News. Some note that even the largest fines leveled by federal regulators still probably pale in comparison to the cost of an explosion that shuts a pipeline down for a long time. Columbia spent $5.5 million after the West Virginia explosion to upgrade its lines to accommodate high-tech inspections. That's more than all of PHMSA's fines for explosions and fires since 2010. It also spent another $3 million on more basic repairs. And it settled lawsuits with nearby homeowners for undisclosed amounts. "The steps and cost necessary to correct the situation at the incident location and potentially across a pipeline system can be significant regardless of any financial penalty," said John Stoody, an executive with the Association of Oil Pipe Lines. PHMSA has laid out in official documents how it considers what size a fine should be. But the Pipeline Safety Trust's Craven said it's far less clear how PHMSA decides whether or not to seek a civil penalty in the first place. A statement forwarded to E&E News by a PHMSA spokesman says the agency takes enforcement actions based on whether a company has likely violated regulations. It then factors in whether the violation might have caused an incident and whether the company's response was appropriate. Civil penalties are set by Congress at $209,002 per day for each day the violation continues, the agency noted, with a maximum of $2,090,022 for a related series of violations. One reason for PHMSA's reluctant approach to fines is federal pipeline law itself. Congress has given the agency significantly less enforcement power than environmental regulators such as EPA. Spilling oil into a river, for example, is almost automatically a violation of the Clean Water Act. Having a spill or an explosion on a pipeline, however, doesn't necessarily violate PHMSA's pipeline safety rules. Instead, PHMSA requires operators to maintain their pipelines properly and continually look for problems. They can be penalized for not looking for problems, but as long as they have inspected and made reasonable decisions about when to fix the problems they found, they're in compliance. That's the case even if those decisions turn out to be wrong. Federal appeals court judges made that clear after PHMSA tried to fine Exxon Mobil Corp. $2.6 million for a 2013 spill in Mayflower, Ark., that dumped 134,000 gallons of goopy oil sands crude after a seam failed. Exxon officials had decided the pipe was not likely to rupture due to seam failure. Exxon's fine was slashed by 90 percent after the 5th U.S. Circuit Court of Appeals ruled that Congress had not authorized PHMSA to penalize pipeline operators for every mishap, even major ones. "The fact that the Mayflower release occurred, while regrettable, does not necessarily mean that Exxon Mobil failed to abide by the pipeline integrity regulations," the judges wrote. "Despite adherence to safety guidelines and regulations, oil spills still do occur." Federal environmental laws such as the Clean Water Act were created in the late 1960s and early '70s at a time when Congress was more pro-regulation. Key aspects of pipeline safety laws were drafted after the 1994 "Republican Revolution," led by Rep. Newt Gingrich (R-Ga.), transformed Congress and made deregulation a priority. Pipeline safety was one of the few areas where the new majority succeeded in placing its deregulatory stamp, according to Sara Rollet Gosman, a University of Arkansas law professor, who wrote a paper on the legislation. Its passage in 1996, she said, left PHMSA dependent on industry and with diminished authority. "The congressional reforms [from 1996] are designed to keep PHMSA from regulating too much," said Gosman, who serves on the board of the Pipeline Safety Trust. "Therefore, some incidents will occur because it would have been too costly for the industry to prevent them." In oil spill cases, EPA often steps in later to impose fines, even when PHMSA did not. For example, Exxon Mobil paid a $3.2 million fine in a settlement with EPA over the Mayflower spill. 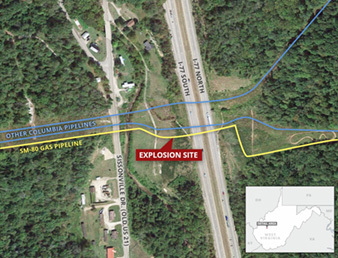 But in gas explosion cases, such as the 2012 Sissonville rupture that trapped Sue Bonham, EPA doesn't usually step in. So the total penalty imposed by federal regulators is generally lower for gas explosions than it is for major oil spills. There are any number of ways Bonham, a retired legal secretary, could have died that day. Her first thought was to dive into her pool, but the water likely would have scalded her. If she had stayed in her home, she learned, she would have suffocated as heat sucked air out of the house. She reunited with the four firefighters last month and returned for the first time to the spot where she'd hid from the fire. They still marvel at the intensity of the blast, recalling brown dirt scorched red and a stream of molten aluminum that apparently used to be a car, or part of one. "Everybody here has fought their fair share of brush fires," said one, Drew Foutty, as the group looked over the site. "That's not at all what this looked like. Brush fires leave something behind. And this didn't." Paul Bonham, Sue's husband, said he felt that Columbia treated the couple fairly after the blast. The company bought their damaged house, then deeded it back to them. A small-engine repair shop is now where their house once stood. But Sue Bonham thinks that the company brass shifted blame for the blast to lower-level employees. And she's watched as the area has again embraced the oil and gas industry and the pipelines that come with it. "I think they should be held accountable for the lack of control and monitoring they had," Bonham said. "I think it's all been swept under the rug."